Moulin Roty Les Jouets Metal Small Spinning..
Moulin Roty Les Jouets Metal Large Spinning..
Moulin Roty Les Zig et Zag Bead Maze Activi..
Moulin Roty Les Bambins Small Spinning Top ..
Moulin Roty Les Bambins Large Spinning Top ..
Moulin Roty Les Papoum Wooden Pop-Up Game 1..
Moulin Roty Les Jouets Metal Rolly-Poly Sub..
Moulin Roty Les Papoum Large Spinning Top 2..
Moulin Roty Les Popipop Colours Lotto 21x11..
Moulin Roty Les Petites Merveilles Magnetic..
Moulin Roty Les Popipop Wooden Magnetic Let..
Moulin Roty Les Popipop Getting Dressed Mag..
Moulin Roty Les Popipop Happy Families 10x6..
Moulin Roty Les Petites Merveilles Magic Pi..
Moulin Roty Les Petites Merveilles Magic Ch..
Moulin Roty Les Petites Merveilles Magic Sp..
Moulin Roty Les Jolis Pas Beaux Safe PU Sof..
Bop the friendly alien on the head to see him spin and move around with lights and fun sounds. 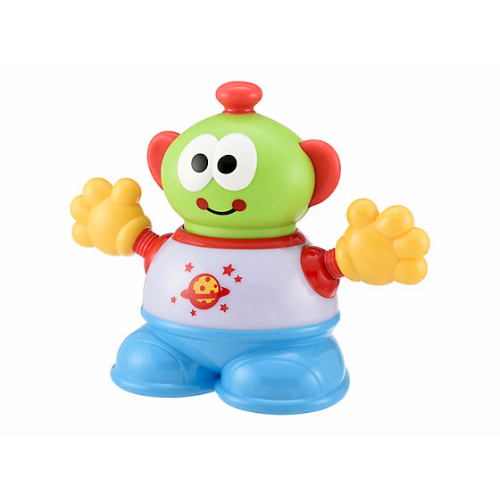 The Bop and Go Alien is great for encouraging active play and getting your little one moving: Bop the alien on its head to see flashing lights, hear funny sounds and make him spin and move around, then chase after him to make him move again. Great for encouraging movement, the bop and go alien will also help develop reactions, balance and skill and will encourage your little one to look, listen and touch.